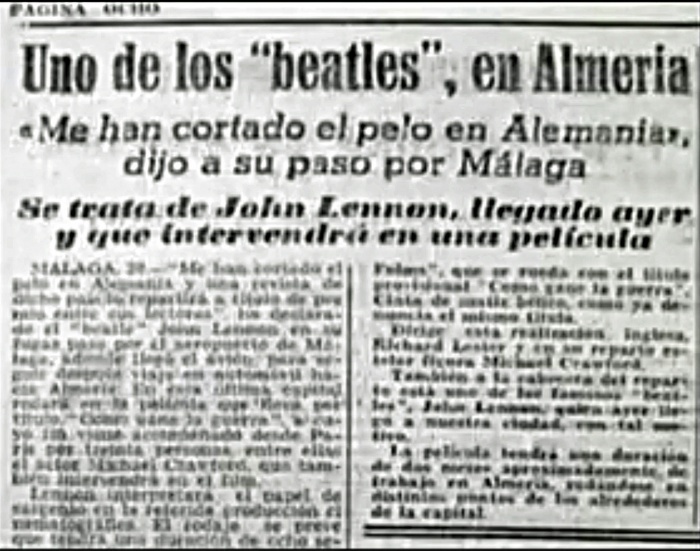 The recent Lennon Almería Forever festival in Almería city was a huge success with Lennon fans from across the region meeting up in an evening of Beatlemania last Friday. Professor Juan Carrión was guest of honour, and even at the age of 90 was still sprightly, according to guests there. Juan is a famous English language teacher who setup a chain of English schools, and pioneered the informal method of teaching English, by reading and singing, especially Beatle songs, which he loved. When he heard, back in the 60’s, that Lennon was filming How the war was won in Almería he travelled down by bus from Cartagena and spent a week pestering the entourage until he was granted an interview with the big man. The night, held at the Gran Hotel (where Lennon always stayed when he was in town – he had to, it was the only decent hotel, and was purpose built to accommodate the foreign film stars of the time) was four hours of beatle music. Journalist Adolfo Iglesias also launched his new book, “Juan & John, el profesor y Lennon en Almería para siempre” about the meeting of the two, and the time that John L spent in the province. This entry was posted in Blog and tagged celebrity, film, john lennon, juan carrion, the beatles by David. Bookmark the permalink.